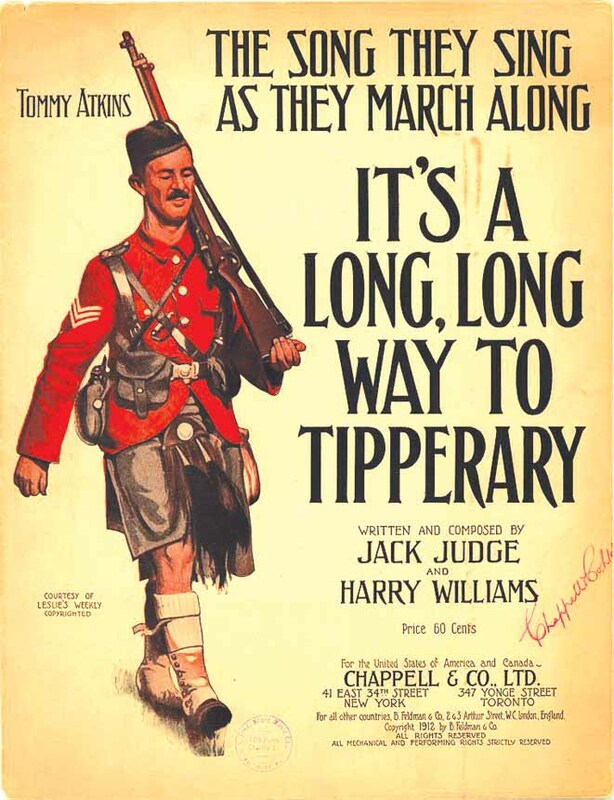 Tom Deignan examines the WWI marching tune. This year marks the 100th anniversary of America’s entry into World War I, which is forever linked to that famous tune about the central Irish county. The song was, in fact, written before the war even started. Its origins are somewhat hazy – and have, in fact, been challenged in court – though all agree the son of Irish immigrants to England played a central role in bringing the song to the masses. His name was Jack Judge. Born in 1872, Judge’s parents were from Mayo but his grandparents were from Tipperary. Originally a fishmonger, Judge always aspired to a life in show business. While performing in British musical halls and theaters, Judge, along with a neighbor named Harry Williams, wrote a peppy tune about, fittingly, an Irish immigrant to London who misses the love of his life back home in Ireland. The first version of the song was actually set in Connemara, though Judge later made the wise decision that Tipperary sounded more musical. How did this upbeat immigrant love story become associated with the gruesome war that would engulf Europe from 1914 to 1918? The story goes that a Daily Mail war correspondent named George Curnock was covering the British Expeditionary Forces at the beginning of the war, in August 1914. The British troops’ mission was to aid the French in what many believed would be little more than a brief skirmish with the Germans. Not long after Curnock filed his column, the song’s popularity began to spread. “Reprintings of the sheet music (there were many) bore the subheading ‘The Marching Anthem on the Battlefields of Europe, Sung by the Soldiers of the King,’” Max Cryer notes in his book Love Me Tender: The Stories Behind the World’s Favorite Songs. If Curnock introduced the song to a wider audience, it went positively viral (at least by early 20th century standards) when legendary Irish tenor John McCormack recorded his own wildly popular version of the song later that year. Perhaps inevitably, there were lawsuits when the song became popular. Also, over the years, relatives of Harry Williams have said that he failed to get sufficient credit for writing the music, mainly because Judge often performed the song, while Williams was never a singer. “When Harry died, I think everyone forgot about him. He is a forgotten hero. We’ve always had this thing in our family to try and prove he was the one who wrote ‘Tipperary,’” Williams’s great niece Meg Pybus told the London Daily Mirror in 2012.